Ann Arbor is a beautiful city, filled with diversity, culture, and art. Of course, Ann Arbor is home to the University of Michigan since 1837. U of M employs about 30,000 workers from the city and is a big part of Ann Arbors economy. The city was originally founded in 1824 and then 13 years later the University of Michigan moved there creating rapid growth. At one point in 1833, the city offered the state of Michigan 40 acres to be the site of the state capital, but they lost out to Lansing. The city has a total of 28.70 square miles and 2017 estimates have the population around 121,477 people. In addition, the biggest body of water is the Huron River and the city is part of Washtenaw County. The city has quite a bit of tree, nearly 50,000, which leads to its nickname “Tree Town”. The main business districts of the city are located near I-94 and Ann Arbor-Saline Rd, among other business areas near the school. When it comes to the different types of houses the city has to offer, they vary from 19th and early 20th-century designs. Of course, near the university, most housing is apartments and houses primarily filled willed with college students. The more contemporary-style houses are located further from the school as well as ranch style homes. As a homeowner in Ann Arbor, you may want to enhance your backyard to enjoy the beautiful weather. That is where the experts at Miles Bradley come in. We can help you decide what is best for your yard, a new composite deck or maybe a pergola, we can help with it all. In addition, to serving Ann Arbor, we also serve cities such as Chelsea, Dexter, Manchester, Milan, Saline, and Ypsilanti. We specialize in deck building, but that is not the only option you have for your yard. If you are looking for a more unique feel and style for your yard, you may want to consider a trellis, pergola or columns for your yard. Trellis – Is a wooden structure usually used to help plants grow up a wall for example. They are used as an accent piece in a well-kept garden. Pergola – A pergola is used to enhance your outdoor entertaining area, they can provide shade and unique elegant look. They can give you privacy, create space for plants, shade, add value, and combine with other structures such as decks. Columns – A column can give your yard the unique look you always wanted. Columns can be used in conjunction with decks to really give it a great look. 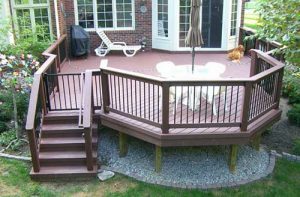 Now, in addition to these great options for your yard, the one we highly recommend is a composite low maintenance deck. What we mean by low maintenance is it is made by using Trex decking. By choosing a Trex deck, you will not need to maintain the deck nearly as much as a traditional wood deck. Wood decks splinter and each season you will need to sand and stain your wood deck. With a composite deck, you do not need to worry about that, it will be good for years to come. Of course, we also offer wood decks as well. By meeting with one of our experts, we can go over all of your options and which deck best suits your needs. A composite deck is a great addition to your home. But that is not the only option when adding to your home. We here at Miles Bradley also offer enclosures and gazebos. Have you always wanted a nice dry place to sit without insects annoying? A beautiful enclosure off the back of your house is a great way to enjoy the fresh air. Our enclosures are screended in and have leictrical for fans or sky lights. If gazebo is what you need then we can build that too. A gazebo is a perfect cover for a new hot tub or sitting area. This is just some of the great services Miles Bradley can provide. Call us today at 248-478-8660. You can request a quote, and one of our representatives will contact you. Ann Arbor is a beautiful city, enjoy your backyard with a new deck from Miles Bradley!